What do birds mean to you? 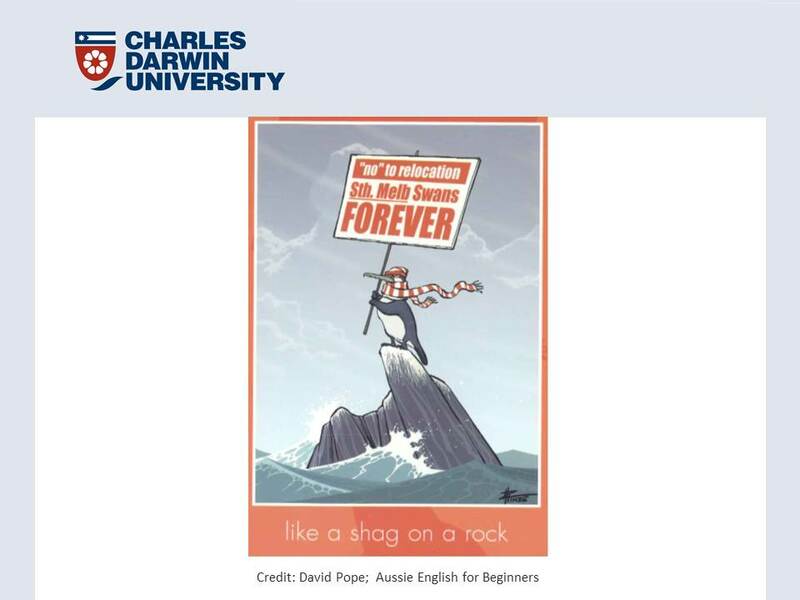 I’d like to suggest that Australian birds are much more valuable to us than we may realize. Over 300 bird species give their names to Australian streets and towns. 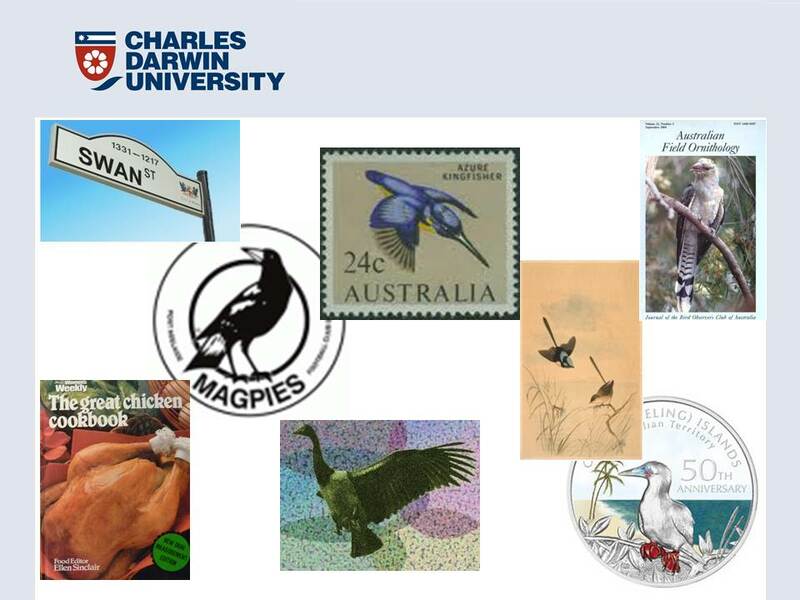 85 Aussie stamps feature different native birds. Our governments, councils and defense forces all use birds as emblems to symbolize their values. Birds also add richness to our language: we talk about budgie smugglers and ostrich policies; something can be grouse and someone a drongo. The images above represent some of the values our society holds for birds. For example those in the top left corner represent a cultural symbolic value. In the right top corner we see a scientific interest in particular species of birds. The artwork represents an aesthetic value. A spiritual value is found in the role that native birds play in Aboriginal myths. And of course we also hold a utilitarian value for some species of birds. I chose this picture because many of our native birds are quite literally facing this predicament. There are over 800 bird species in Australia. Two thirds are in long term decline. 1 in 5 are endangered. Habitat loss is their main threat. Well, my research aims to strengthen the connection between our cultural heritage and our natural heritage by describing how native birds are valued by Australians today. To do this I’ve established a set of 12 value categories. Several of these are expressed in this picture, such as: conservation, cultural symbolism, anthropomorphism and ecology. First I measured how each of our native birds is represented in Australian society and you just saw some examples of that. Then I surveyed the general public and I asked them about their attitudes towards native birds. Now I’m using qualitative case studies to investigate the social forces at work in threatened bird conservation and how the values held for specific threatened birds may affect the success of strategies used to conserve them. For example take the orange-bellied parrot. The orange-bellied parrot is one of only two migratory parrots in Australia. It’s also one of the world’s most endangered animals. Experts estimate there are between 26 to 40 adult birds left in the wild. In summer the wild birds breed in the forests of south-west Tasmania, in winter they feed on the coastal saltmarsh of Victoria and South Australia. Each year these tiny birds fly back and forth across the Bass Strait not knowing whether drought or development will have left them the resources they need to survive. You might have already heard about the orange-bellied parrot as it’s been the focus of much negative media attention due to supposedly preventing the development of a chemical plant in Victoria in 1994. The Victorian Premier at the time, Jeff Kennett, made his feelings clear when he called it a trumped up corella. This parrot is probably even more famous for supposedly preventing Bald Hills wind farm from going ahead 12 years later. 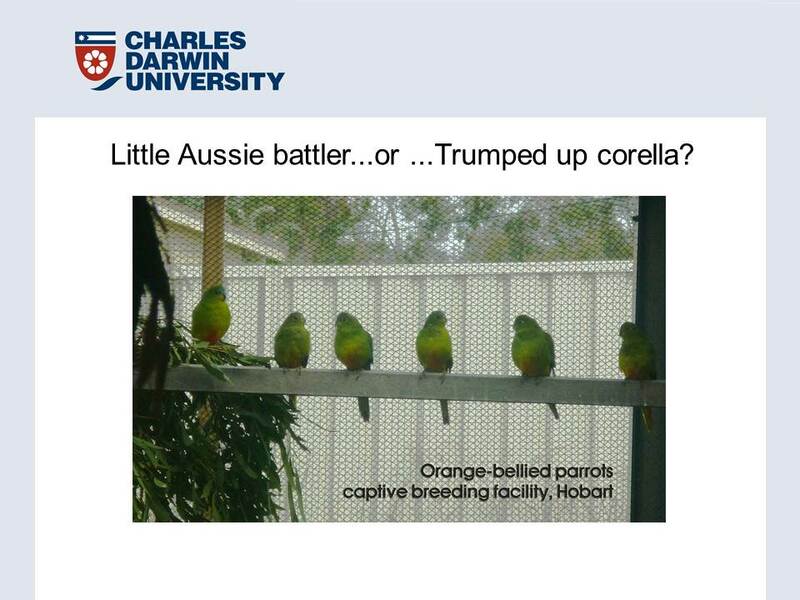 In both cases the media reported that these developments didn’t go ahead because orange-bellied parrots would be adversely affected by them. For example chemical spillage from the chemical plant could ruin their habitat and the birds could fly into the wind turbines. But in actual fact it was for economic and political reasons that these developments didn’t go ahead. Nothing to do with concern for the parrots. This tiny endangered bird was picked up and bandied around like a political football. There is also an insurance population of about 100 birds which are part of a captive breeding program. If the captive birds breed successfully over the next few years they may be released back into the wild. But what will happen in the meantime? Will the scientific community have worked out by then why the population’s declining so dramatically? Will there be any wild birds left to teach the captive ones where to breed or where to migrate to? Will landholders on the mainland protect the saltmarshes these birds need or will it be developed to suit our own needs? Is this migratory bird which has evolved to fly thousands of kilometers over its lifetime fated to exist only in captivity? Millions of dollars have already been invested in conserving this little bird. Should yet more money be spent trying to keep it alive when the odds for its long term survival seem so low? And yet, can a wealthy modern society as we have in Australia today allow a species to go extinct under its watch? The phrase trumped up corella has come to symbolise the significant cultural, economic and attitudinal differences that need to be addressed if we want to succeed in rescuing this beautiful little bird. These decisions are made by society and are based on the values we hold about preserving our natural heritage. Society decides whether it’s worth it or not. Society includes you and me. So, next time you come across a bird….either in a tree, on a label or a coin….think again about what birds mean to us, how diminished our lives would be without them and how we can ensure they remain a valuable part of our future.